The three days of 1984. 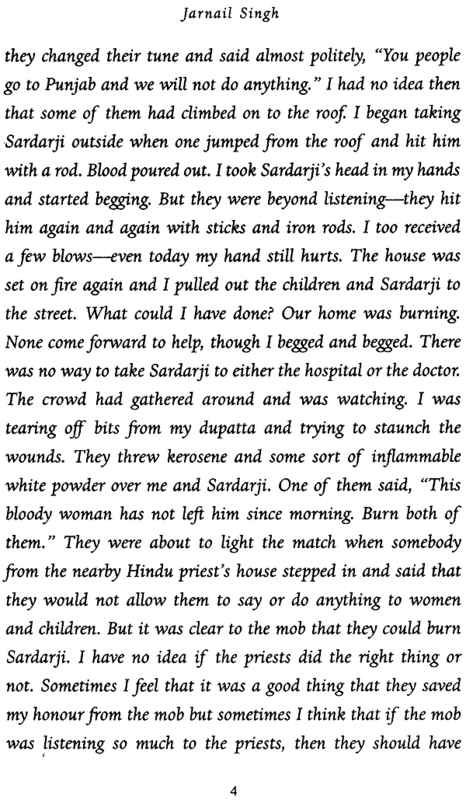 When over 3000 Sikhs were slaughtered, have indelibly marked the lives of thousand more who continue to exist in a twilight of bitterness and despair. 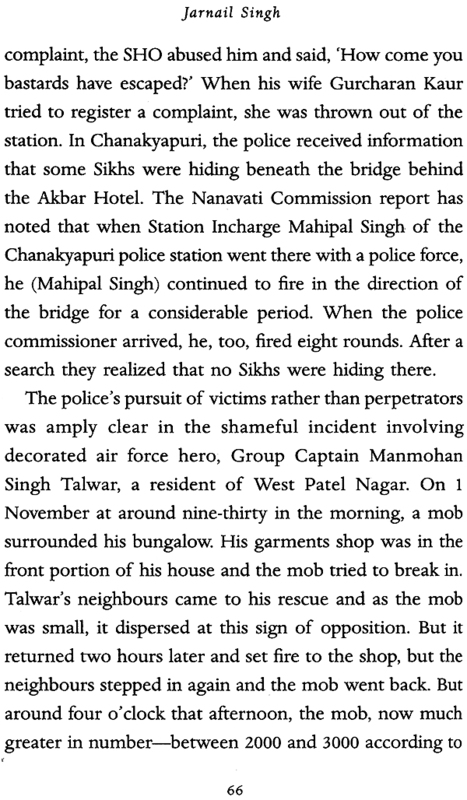 It was outrage at this state of affairs that led Jarnail Singh-an unassuming. Law-abiding journalist-to throw his shoe at Home Minister P. Chidambaram during a press conference in New Delhi. He readily acknowledges that this was not an appropriate means of protest, but asks why, twenty-seven years after the massacres, so little has been done to address the issues that are still unresolved and a source of anguish to the whole community. I Accuse … is a powerful and passionate indictment of the state’s response to the killings of 1984. By exploring the chain of events, the survivors’ stories and the continuing shadow it casts over their lives, Singh seeks answers to some relevant questions. Who initiated the pogrom and why? Why did the state apparatus allow it to happen? Why, despite the many commissions and committees set up to investigate the events, have the perpetrators not been brought to book? Because. Finally, 1984 was not an attack on the Sikh community alone; it was an attack on the idea at the very core of democracy-that every citizen, irrespective of faith and community, has a right to life, security and justice. Jarnail Singh was born in Delhi in 1973. After a master’s degree in political science from PGDAV College, he completed a diploma in journalism from the YMCA in 1994. He was special correspondent with Dainik Jagran, Delhi, for ten years, covering the field of Sikh politics and defence. He has written extensively on the Sikh massacre of 1984 and its aftermath. He lives with his wife and two children in New Delhi. 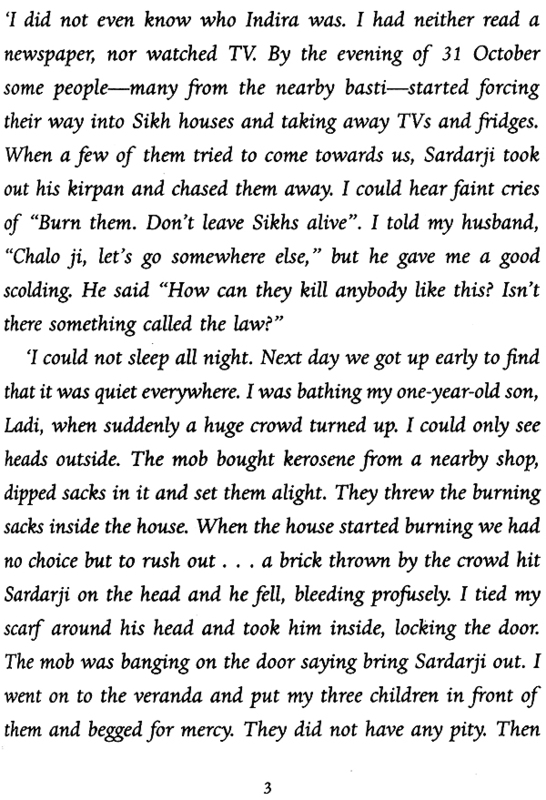 Jarnail Singh's I Accuse ... is a shocking book that should shame every citizen of India. 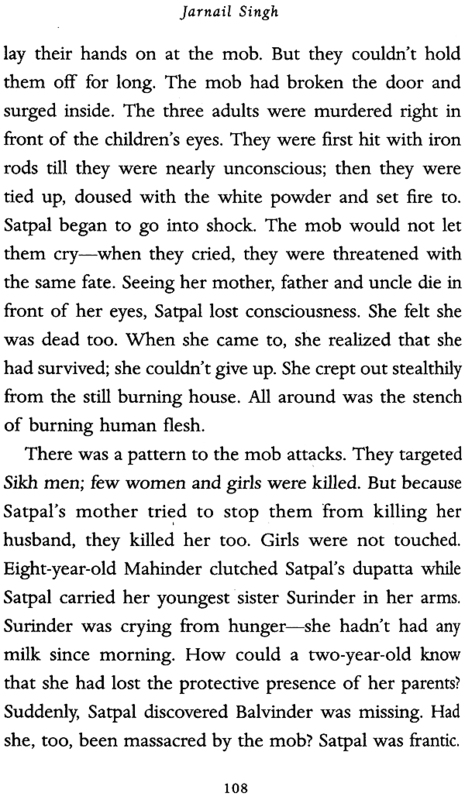 It is a searing account of the brutal massacre of Sikhs in Delhi and other parts of north India following the assassination of Mrs Gandhi by two of her Sikh bodyguards. It is also a scathing indictment of the people who planned and perpetrated the massacre and of those in power who displayed criminal indifference to the widespread killing and destruction of property. This includes the then president Giani Zail Singh who shrugged off his responsibility as head of state and Narasimha Rao who abdicated his responsibility to restore law and order as the country's home minister. The book is also unsparing in its description of the role played in the killings by lackeys of the Congress Party, many of whom, including H.K.L. 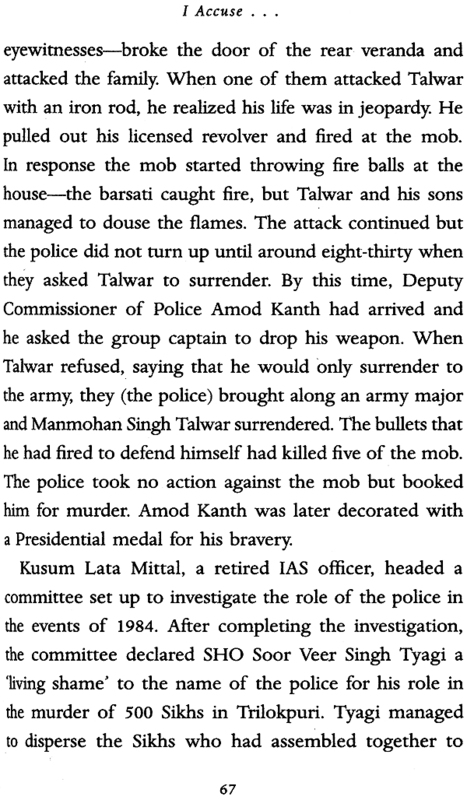 Bhagat, Dharam Dass Shastri, Jagdish Tytler and Sajjan Kumar, according to many testimonies, which I fully believe, took active part by leading mobs of hooligans to attack gurdwaras and Sikh localities. Far from being punished for their actions, they were rewarded by Prime Minister Rajiv Gandhi by being accommodated in his cabinet of ministers. He himself exonerated the killers of innocent people in his first public speech after he took over as prime minister, by saying, 'But when a mighty tree falls, it is only natural that the earth around it does shake a little.' It is a long tale of injustice which rankles in one's mind to this day. Jarnail Singh picked on the wrong man to hurl his shoe at. P.C. 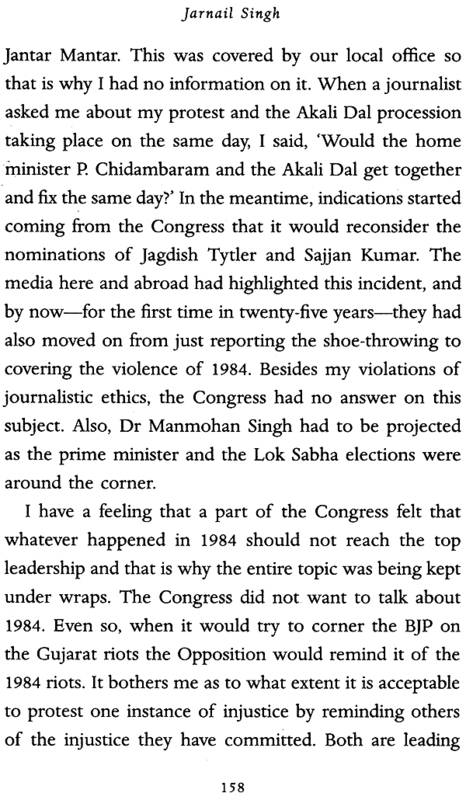 Chidambaram had nothing whatsoever to do with the pogrom of 1984. 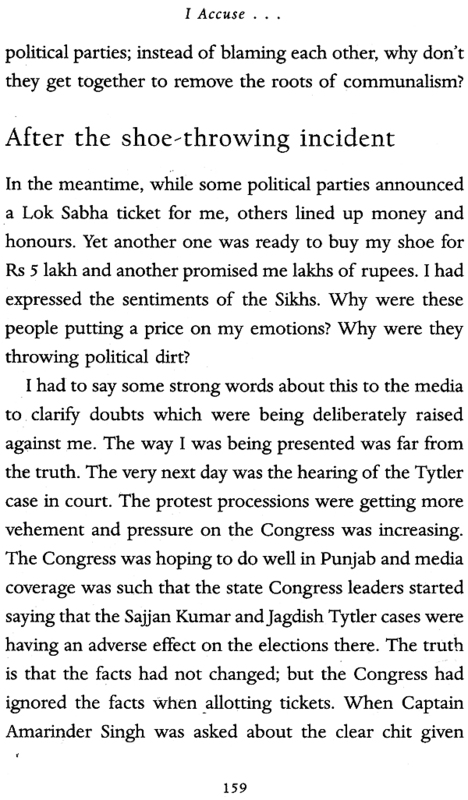 However the shoe missed its target and that is just as well since Jarnail Singh has said repeatedly, as he does in this book, that it was an emotional reaction which he is not proud of. But it roused people's conscience against the patronage extended by the Congress Party to men like Tytler and Sajjan Kumar, both of whom were again picked as the party's candidates in the Lok Sabha elections. Jarnail Singh's action at least ensured that they were dropped by the Congress from its final list of candidates. However, those responsible for the massacre still need to be brought to justice. I Accuse ... opens wounds which have not yet healed. It is a must-read for all those who wish that such horrendous crimes do not take place again.